Figure 1. Multiple cloud-to-ground and cloud-to-cloud lightning strokes during night-time. Credit: NOAA. Figure 2. 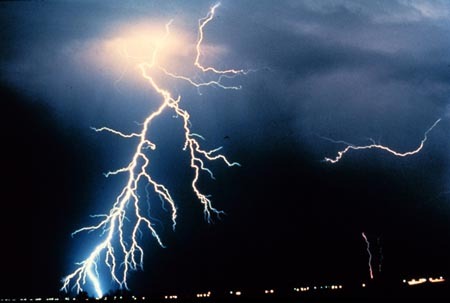 Lightning strokes are caused by an electrical imbalance between clouds or between clouds and the earth. The base of the cloud can have an excess of electrons and then draws positive ions to the ground underneath it. The potential difference grows until there is a sudden flow of electrons (the flash), neutralizing charges on both the ground and the cloud. Figure 3. The formation of lightning strokes with a big storm cloud (A), within which there is a significant temperature difference. Elecrons move downwards and positive ions move upwards with the cloud, causing positive ions to gather on the earth below. When there are sufficient electrons, a sudden breakdown of the air occurs and a stream of electrons shoots earthwards (B) to be met by an upward stream of ions (C). 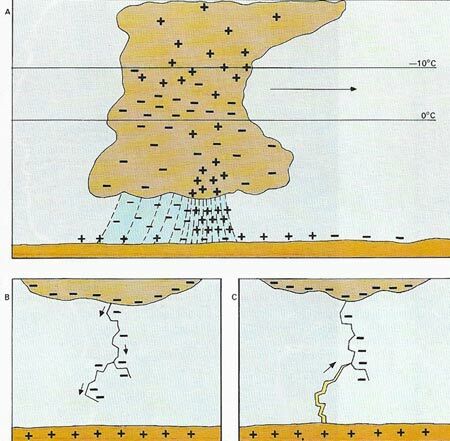 Lightning is a discharge of atmospheric electricity resulting in a flash of light in the sky (see Figure 1). Most lightning occurs between two parts of a single cloud, some between cloud and ground, and a small amount between one cloud and another. Flashes range from a few kilometers to about 150 kilometers in length, and typically have an energy of around 300 kWh and an electromotive force around 100 megavolts. 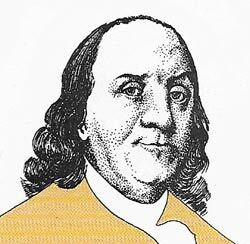 Benjamin Franklin was the first to recognize the true nature of lightning. During a thunderstorm he induced a flash of lightning to flow along the string of a kite to the earth. 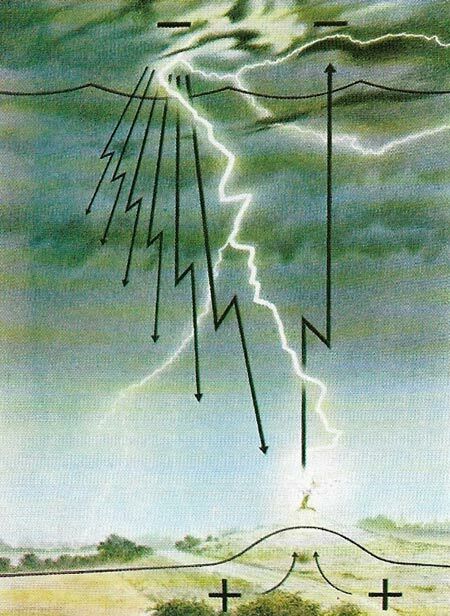 A typical discharge consists of several lightning strokes, initiated by leaders that follow an irregular path of least resistance – the lightning channel. Intense heating by the discharge expands the channel rapidly up to a diameter of 13–25 centimeters (5–10 inches), creating the sound waves of thunder. Cloud-to-ground lightning usually appears as forked lightning. A relatively faint light moves towards the ground at about 125 kilometers per second in steps, often branching or forking. As this first pulse (leader stroke) nears the ground, electrical discharges (streamers) arise from terrestrial objects; where a streamer meets the leader stroke a brilliant, high-current flash (return stroke) travels up along the ionized path created by the leader stroke at about 100 million meters per second (nearly half the speed of light). Several exchanges along the same path may occur. If strong wind moves the ionized path, ribbon lightning results. Sheet lightning occurs when a cloud either is illuminated from within or reflects a flash from outside, in the latter case being called heat lightning (often seen on the horizon at the end of a hot day). Ball lightning, a small luminous ball near the ground, often vanishing with an explosion, and bead lightning, the appearance of luminous beads along the channel of a stroke, are rare. Lightning results from a buildup of opposed electric charge in, usually a cumulonimbus clouds, negative near the ground and positive on high. There are several theories which purport to explain this buildup.